Acupuncture is part of the practice of Traditional Chinese medicine which is holistic and preventive. It has been used to alleviate pain and promote overall health. 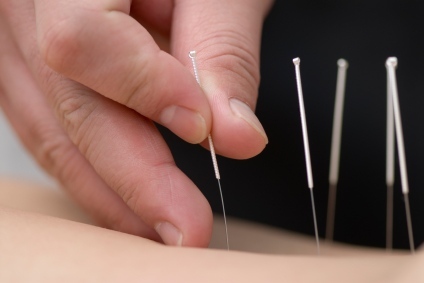 Acupuncture uses needles placed along invisible meridians that run throughout the body. Today, acupuncturists also use lasers, magnets and electric pulses in addition to needles. Each meridian point has a specific meaning and can unblock and repair meridians and channels with vital energy or chi. Through the stimulation of the meridians, an acupuncturist is able to restore balance and ergo health to the patient. 1. Treat the root cause so the symptoms will subside. 2. Balance the energy within to restore normal functions of the organs/systems. 3. Provide education on health lifestyle. Acupuncture originated in China more than 3000 years ago and with its proven effectiveness, it has been well accepted throughout the world. Acupuncture is practiced alongside Western medicine in most hospitals in modern China. It is one of the most known modalities of the discipline of Traditional Chinese Medicine, TCM, which includes herbal medicine, acupressure, food therapy, therapeutic body work, breathing exercise (Tai Chi & Qi Gong) and lifestyle counseling. TCM and Western medicine complement each other and can be integrated to offer optimal health care. Augmentation of Immunity - Acupuncture raises levels of specific hormones prostaglandins, white blood counts, gamma globulins, and overall anti-body levels. The "Endorphin" Theory - Acupuncture stimulates the secretions of endorphins in the body. The "Neurotransmitter" Theory - Acupuncture affects certain neurotransmitter levels such as Serotonin and Noradrenalin. "Circulatory" Theory - Acupuncture has the effect of constricting or dilating blood vessels. This may be caused by the body's release of Vasodilators, such as Histamine, in response to Acupuncture. "Gate Control" Theory - According to this theory, Acupuncture closes certain nerve gates by strategically overloading them with impulses, thus reducing pain transmission. On your first visit, we will start by talking about your health history and the condition for which you are seeking treatment. We will also discuss your general health to find out if there is any reason Acupuncture would not be appropriate. We'll ask a number of questions that will give us a picture of your body's constitution, your lifestyle, and a history of any conditions or illness. Next, we'll look at your tongue and feel the pulse. Both of these are important assessment tools in Chinese Medicine. After that you'll lie on a table, much like those used for massage. If you wear loose fitting clothing, it is usually not necessary to remove more than your shoes and socks. The treatment, which most people find calming and relaxing, begins by placing a few sterile, disposable needles in points on your body. They are left in for 15-30 minutes to maximize their effectiveness, and then they are removed and disposed of in a bio-hazard container. How long will it take? What can I expect? The number of treatments will depend on your condition. It could vary from two to twelve sessions, depending on whether your condition is chronic or acute, and on your general physical vitality. Acupuncture treatments may also include a variety of non-needle techniques, such as heat lamp, acupressure or Tuina (therapeutic body work), Gua Sha (scraping technique), electrical stimulation and cupping. It depends on what kind of needles and how the needles are inserted. With proper technique usually you'll feel very little or you don’t even feel it when the needles are inserted. Yes! Only pre-sterilized, disposable needles are used. The points on your body are swabbed with alcohol to ensure they are disinfected before the needles are inserted. Can I get insurance coverage for the treatments? Insurance companies vary in their coverage. Nowadays, most insurance companies do cover acupuncture and we can check it for you.